I’ve always thought it was funny that my name is Dawn- because I’m not a morning person. I wake up like a bear, needing my coffee and silence for at least the first thirty minutes of the day. I may not be a morning person, but I’ve learned…. this trait is all the more reason for intentionally setting up my mornings for success. The way our mornings start sets the tone for the rest of our day. We don’t always have a choice on what time our days need to start, because of work or children, but I’m learning, if I can get just a couple of steps ahead, starting my morning on my own terms, then my days are more peaceful and productive. Peaceful, productive mornings are a best source of motivation for me get me up earlier, even though it doesn’t come naturally or easily to push off that thick down comforter, slip my feet into the slippers by my bed, and get up in the dark hours of the morning. Are your mornings as peaceful and productive as you would like them to be? I still have room for improvement, and I’m guessing I’m not the only one. At the beginning of this summer, right before my kids got out of school for break, I began thinking about how the change from school morning routine to summer mornings, (which often lack any sort of routine) always threw me for a loop. This summer, I wanted to keep working at my writing, and I knew that if I didn’t come up with a plan, I would have a hard time meeting both the needs of my family and my work schedule. This is when a friend of mine recommended the Make Over Your Mornings online course. It was just what I needed to help me come up with the plan I needed. Crystal Paine, of Money Saving Mom, teaches this 14-day online course, which teaches how to set realistic goals and streamline your morning, tasks so that you’re more organized and productive. It’s not about guilt tripping you into just getting up earlier. It’s about making space for the things you love. I found this course to be helpful as I implemented the strategies I learned and developed a summer routine that worked well for both my family and me. Now that my kids are back in school, my routine has once again changed. I’ve decided to take a refresher course with Make Over Your Mornings- because I know that it will help me re-evaluate my goals and re-focus and what works with this new routine. I have access to the videos and content for as long as I like, so I don’t need to buy it again. 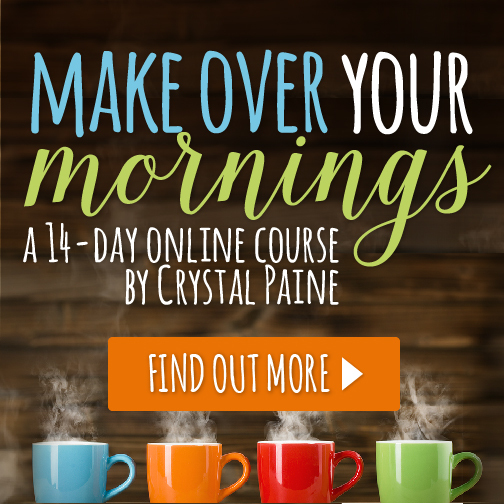 If your mornings are leaving you feeling like you’re always playing catch up, or they’re just not as productive and peaceful as you would like them to be, then I invite you to join me in taking this self-paced, short online course. It only takes about 15 minutes per day. I believe that this course is invaluable for so many reasons- for both SAHM’s and WAHM’s. If it’s not a good fit though, Crystal offers 100% money back guarantee 30 days after you purchase the course- so there’s no risk at all. The 14-day course is only $17 dollars right now. This price includes videos for each day and a workbook. The results are pretty amazing. I’m looking forward to starting this course next week. If you want to join me, you can sign up here. Let me know how it goes! I’d love to hear about it. *I’m an affiliate for Make Over Your Mornings- all opinions are my own-if you sign up from my link, I do receive a percentage of the profit at no additional cost to you. This helps support the costs involved with running this blog. Thank you.